Wait, did you just catch my use of the word stunning? You see Kemps frozen yogurt in the title and then you think back to the Kemp's yogurt I was so hard on last year. Was I just too harsh last time? Heck no, I still stand by my findings that those little parfait cups are absolutely disgusting ---BUT--- this is not tart yogurt my friends, this is sweet yogurt, and you're gonna be impressed! Behold Kemps Premium Frozen yogurt with live & active cultures, oh boy! This is their Moose Tracks flavor, it's artificially flavored vanilla frozen yogurt with peanut butter cups swirled with moose tracks fudge. It even has that Denali "Original" Moose Tracks logo on the container. (I thought someone might have guessed it from the picture, but I freely admit that even though I tried, it still wasn't a very good shot). Ok, here's an opening shot just below the surface. 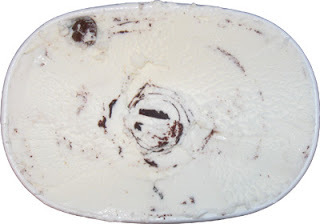 The fudge swirls are hiding in the center there. This behavior continues throughout the ice cream. Not sure if it's just my container or it's always like that. Notice the lone peanut butter cup at the top there. Here's one of the pb cups during the Penny Test. Here's one sliced open. Keep in mind this pb cup is fresh from the cold ice cream yet the peanut butter is an ooey gooey substance already. If you let the pb cup sit out for awhile, the whole thing will be pretty much start to melt and be extremely smushy. So you are thinking this is all well and good, but I said it was stunning, so get to the point already! Was I stunned by a boatload of pb cups? 'fraid not. there's an ok smattering of them, but nothing to write home about. Ok, so is it the fudge swirl then? well, the swirl is pretty nice. It's quiet stiff actually, you definitely wouldn't call it a ribbon. Sometimes it's thick and sometimes it branches out into much thinner swirls. The taste is different too (compared to other swirls). Still, that's not why I was impressed. Oh the suspense is killing me!! Well, still a little too tired for that, but you have to believe me when I say, holy freholy batman, what has Kemps done?!?! They must have quadruple churned this stuff because the texture is simply fantastic. It really is amazing, and Kemps didn't even have to pay me off to say that. This texture would be good in an ice cream, and they've pulled it off in a frozen yogurt!! Have I mentioned the texture yet? You really have to dig for signs that this isn't some kind of trick. It does start to melt quicker than a standard ice cream BUT the cool thing there is that it's super easy to scoop. If you just need a half dozen bites to tide you over to dinner, that's cool, just dig right in. You don't have to fight with it, it's ready to eat (and no, it wasn't the freezer just on a warm cycle, I've dug into this stuff 4 or 5 times now and it's always the same). And there's no frustrating gummy texture either. Sure, it's easy enough to pile in the additives to fluff up your froyo, but Kemps has avoided that. They've gone into the food labs and worked on this 'til they got it just right. Overall impressions? I'm impressed, I can't say that enough and it's been bugging me since Sunday that I wasn't able to spread the word. Flavor wise, it's respectable and I like it, but I don't adore it. the funny thing is, there's 3 ways to taste this ice cream. First, scoop just the vanilla and you have yourself a pleasant simple bite. Second, grab some fudge in your scoop and run that way. I got varying amounts of fudge in my scoop by the bites tasted similar enough. Lastly, it's peanut butter time. Those little cups will take over the scoop if you manage to snag one (and like I said, you get them somewhat often, but not in every bite). It's kind of like having vanilla, fudge & peanut butter ice cream randomly mixed together. Yes, there is a mild frozen yogurt aftertaste, but it's not bad, it just is. Sometimes that yogurt aftertaste can ruin the whole thing, but I'm ok with it. My only real suggestion here would be this ice cream would simple rock if they would use vanilla bean instead of artificial vanilla (probably vanillin). The texture is already super impressive, but I can only imagine if those amazing little scoops had flecks of vanilla bean in them. Oh yeah, now then it would be near perfect. Ok, I'll stop gushing over this new product (that I found at Market Basket). I can't wait to try another of their flavors. Oh geez, can't forget the health benefits. Now there is fudge and pb cups, so you can't expect a miracle, but the overall fat content is still pretty respectable and makes it easy to justify a double (or triple) serving. I think the texture could be due to the higher fat content compared to other frozen yogurts. Hmmm...I never even heard of the Kemps brand! I tried looking it up online, but can't find out where its sold. Help? Rod: Their other flavors have much less fat (and fudge and peanut butter), so I'm curious to see how they stack up. ETR: Right now this is my favorite frozen yogurt. You won't go "this is the best flavor ever" but you will go "this is the best texture ever!" Anon: I've found various Kemps products at several different locations in Mass, but Kemps is now owned by Hood, which is based in Mass, so I don't know if that affects anything. 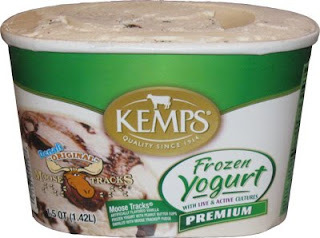 I have found Kemps Premium Frozen Yougurt Denali Moose Tracks at Bi Lo in South Carolina. Love it!!! Im in California. Where can I get Moose tracks frozen yogurt? I love it! Kemp's may say they've got this pure, natural product -- but they gunk too many flavors up with artificial food coloring! Have you seen their new black cherry flavor? Dark, yicky color of the yogurt -- food dye. And even the cherries are dyed -- even though you can buy Dole frozen cherries that look the same and which certainly haven't been dyed! Red food coloring has bad effects on kids, and gives a lot of use headaches at the least -- yet Kemp's adds it to several of their flavors! i am from Florida and WinnDixie always has it on sale buy one get one free. this is my favorite ice cream to get. I am hopelessly addicted to Moose Tracks! Moose Tracks is my favorite! I purchased it at Walmart many times but can not find it there anymore.